Well, the bloggers and news outlets are abuzz with the newly released Cuil (pronounced “cool”). It’s the brainchild of a former Google employee, and went live Monday. After the latest severe swath of Page Rank deaths (Freaky Frugalite got a 0, thank so much you Google jerks; except Andrew- you’re not a jerk), we are all panting with baited breath, ready to cheer on a competitor– any competitor. I suppose this is why Cuil has gotten such rave reviews. After all, the enemy of my enemy is my friend, right? Google has waaaay, waaaaaaaaaaaaaaaay too much power, and right now it looks like the proverbial corruption is on its heels. I checked it out. Eh. 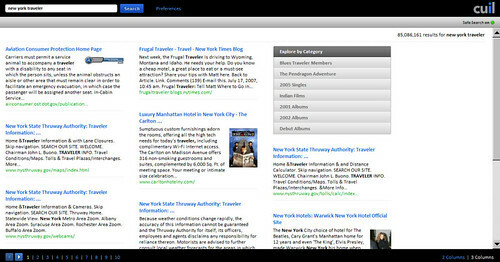 I looked up New York Traveler– I come in #7 for that phrase on Google (after Wikipedia and the Big Wigs), but on Cuil what do I get? Look closer– Number One is “Aviation Consumer Protection Home Page”?!?!?! And the NYS Thruway Authority? And the New York Times’ “Frugal Traveler”?!?! That guy is never in New York! So :-p. Cuil has some improvement. Lots of it. But at least they aren’t powerful enough to kill off my income. Yet.